Sketch renovated the La Moderna house in Panama City, designed in modernist style in 1962. Neglected for years, La Moderna is reborn as a landmark in the historic city centre of Panama with restoration of its stepped façade and the rhythm of its windows on Avenida B. 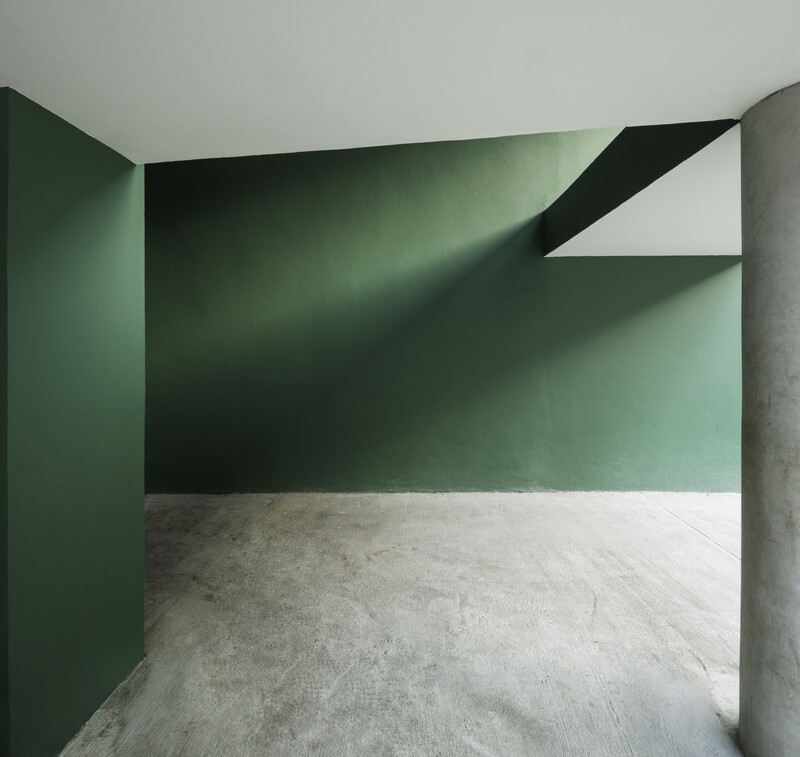 Sketch, the studio founded by Johann Wolfschoon in Panama City in 2006, renovated the La Moderna house, a mixed-use construction in the historic city centre of the capital which had been neglected for many years. La Moderna, built in 1962, is now located in an urban area which is difficult to define in stylistic terms. The building is located at the intersection of Avenida B and Calle 12 Este, on the edge of Casco Viejo, a central district overlooking the bay built in the country’s traditional colonial style. Now popular with tourists, the area has plenty of restaurants and bars, and has preserved and replicated the stylistic features of the architecture that followed the Spanish conquest of the country in the sixteenth century. But Panama is much more now: a careless mix of old and new, where glass skyscrapers built since the sixties cast their shadows over the old city, the city of banks, real estate, hotels, offices and shopping centres, a sad skyline for neighbourhoods where poverty excludes all care and attention for urban development. Even without any particular visual landmarks, the principal periods and movements in twentieth-century architecture made their mark on Panama, but the difficulty of obtaining funds for conservation has populated the city with abandoned buildings, buildings which once determined the impact and vitality of streets and whole neighbourhoods but are now in such poor condition as to make them almost unrecognisable. When Modernism came to the city in the thirties, it still felt the influence of previous idioms, from art nouveau to art deco, and was never expressed in purity but through examples of architectural contamination which are now worth safeguarding as a part of the city’s history. This is the context of the restoration of the La Moderna house, completed by Sketch on the basis of a philosophy that rediscovers and reinforces weight-bearing structures, renovates façades to bring the Modernist style back to life, and updates the interiors in response to today’s levels of comfort and technical requirements. Built in 1962, La Moderna had two walls on the street, on a slight slope, with a powerful, original rhythmic succession of solids and hollows. The western wall on Avenida B was the building’s real front, facing the famous Amador Theatre. Also a mixed-use building, with a theatre on its lower level and a home above it, the Amador, built in 1908, was a well-known cinema throughout the twentieth century, but fell into disuse following the US invasion of Panama in 1989. It has only recently been redeveloped and reopened as a venue for events and life performances, and together with the La Moderna house, it now forms a place of contrasting urban design and a link between the past and the present. When the planning process began in 2014, the interiors and the structure of the La Moderna house were severely deteriorated and there were problems with moisture on the upper levels due to defective waterproofing of the roof. The building now offers the city its stepped façade once again, with four volumes jutting out over the entrance and the mezzanine level. The architects demolished the original rooftop apartments so that they could completely waterproof the roof level and build 12 new small residential units on it, in three lines: five units to the east with views over the Gulf of Panama, three units in the middle with their own internal gardens, and four units on the stepped site, with big covered balconies overlooking Avenida B, the theatre and the rest of the city centre. The lower levels have been completely renovated to create seven commercial premises: four spaces on the basement level, accessed from Calle 12 Este, on a steep slope; the ground level and mezzanine have been redesigned as a single whole, divided into three vertically linked commercial spaces. The first floor has an open floor plan for offices with a glass wall all along Avenida B and around the corner onto Calle 12 Este. The buffer walls built on Avenida B over the years have been reopened and replaced with strip windows to create a more open relationship with the neighbourhood. Combined with the stepped façade and the rhythm of vertical windows on the ground floor, horizontal ones on the mezzanine level and vertical ones again on the first and top floor, add motion to the main façade, like a backdrop for transit along the street. The unusual choice of dark green on the lower levels raises up and lightens the two upper levels, in which the original pure white has been restored.